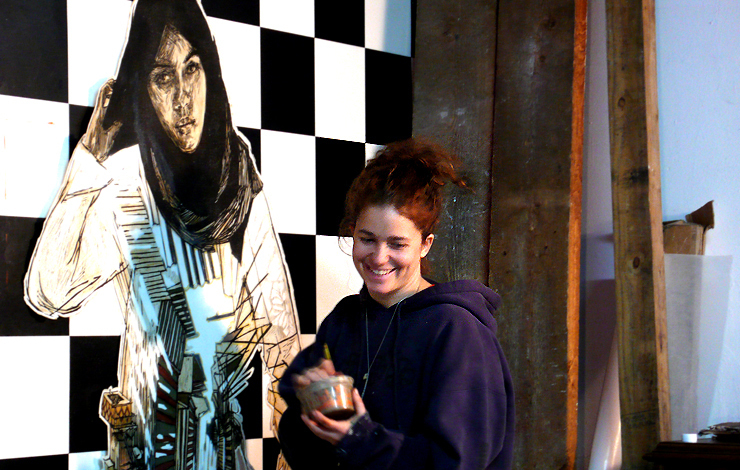 Brooklyn Street Art Blog visits Swoon in her Studio. 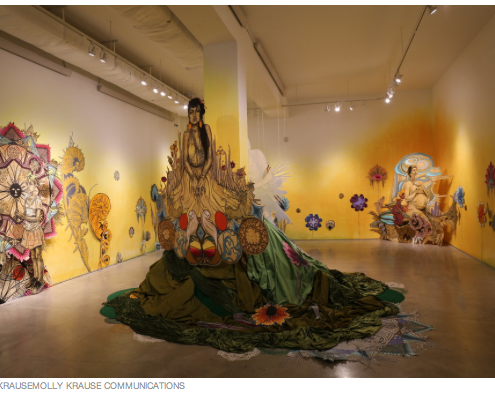 A visit to Swoon’s studio is a full immersion into her passions; meditations on humanity, the process of collaboration, and sculptures you can inhabit. In the rustic warm light of a triple height cavernous space that might have served as a town hall a score of printed artworks on paper lay scattered across the wooden floor. Tiptoeing between the images to cross the formerly grand chamber, the familiar faces of children and adults who you’ve met on walls across the city look up at you. Together these figures, a de facto retrospective of Swoons’ last few years on the street in NYC, are burned into the retina of many a Street Art fan, and yet they lay here on this whitewashed wood-slatted floor without any ceremony at all. Around the rooms’ periphery a handful of assistants listen to music, straddle ladders, and attentively stroke warm earth tones on pieces taped to the wall. A rustling cold wind from the black New York night outside is blocked by clear plastic stretched across the windows, buffeting the draft. 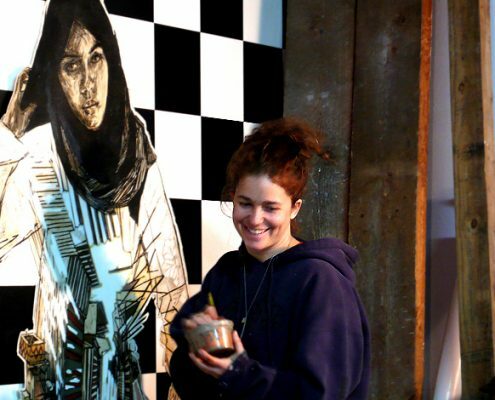 Swoon, one of Brooklyn’s most celebrated street artists, sits on her knees in the warmly lit room, jar in hand, adding shades of ochre to her piece, “Cairo (Sunday Afternoon)”.